Far from being drudgery, cooking today is often celebrated. At its best, it involves gourmet ingredients, innovative recipes, amusing aprons, salt in various colours and handy gadgets and appliances. In that spirit, here are my gift suggestions for the cook (and/or food lover) in your life. 1. 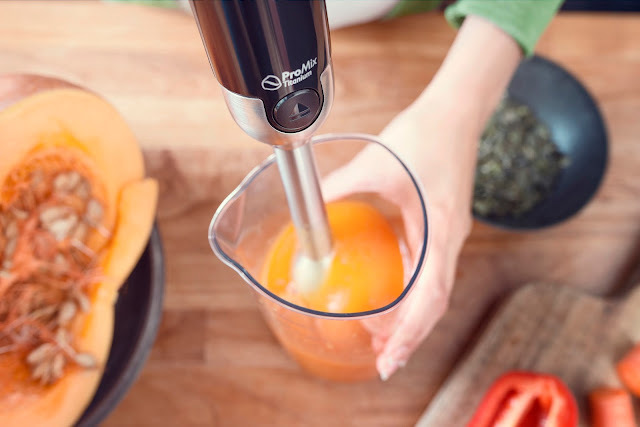 It's soup weather, and Philips' Hand Blender with SpeedTouch technology will take your fave soup recipe up a notch. Use it in a recipe like this this Vegetable Soup With Lentils, when you want your soup to be kind of chunky, but with a nicely blended thickness to it as well. Blending right in the pot is so convenient and a lot less messy. 2. When you're craving a healthy soup, but you want to save on time and effort, Lazy Man's Lentil Soup from The Bean Ladies should do the trick. 3. Anybody who loves kitchen stuff covets special pieces from Le Creuset. I have my eye on this enameled cast iron cookware. 4. Yep, thinking of myself again. I'm loving this Vegan From My Head Tomatoes tee! 5. For the hot beverage enthusiast who is a wee bit grumpy in the morning, this Don't Poke The Bear mug is a must-give. 6. Some of my favourite tableware comes from Toronto's own imm Living - like this gorgeous glossy metallic Candy Rock Copper Crystal Cupcake Plate. 7. Really good salt can be expensive. A bottle of Celtic sea salt makes a great stocking stuffer for a foodie. I use it to add minerals to homemade sports drinks (basically fresh-squeezed orange juice, water and Celtic sea salt) for my son. 8. This Japanese-style no-tie apron is made from natural linen and gets even better with age and washing. Plus it's just cute. 9. Everybody needs a purple giraffe flour sack tea towel! Okay, maybe it's a want, not a need. But this tea towel is hand-drawn and printed on organic cotton. And it's made in Canada. 10. For the foodie who has just about everything, how about this Reindeer Head Salt and Pepper set by Godinger Silver Art Co? 11. There's just something about a cake made in a bundt pan. It turns an ordinary recipe into a celebration. Your baking friend can pay tribute to the bundt pan with this adorable silver tone bundt pan charm. Clearly there is a whole world of gifts out there that celebrate food and our love for it. In fact, I have added plenty of foodie gift ideas to my wish list. And my 12-year-old daughter recently asked me for an apron from her fave YouTuber as a gift. I only wish I had seen the benefits of cooking earlier. Enter to win a Philips Airfryer plus a $150 VISA gift card! Just in time for the holidays, Philips is giving away one of their wonderful airfryers. You know what these are - those awesome small appliances that create crispy French fries with 80 percent less fat! What food lover wouldn't want that? Visit this site for more exciting holiday gift ideas plus a chance to win the Philips Airfryer. (You could give it away to a foodie friend...or maybe just keep it for yourself!) Known for their innovation, top performance, quality and design, Philips appliances are geared to making healthy cooking easier. Find them at Canadian Tire. My gift guide pick, the Philips hand blender, offers seamless power and great results. Its Iconic ProMix blending bar is uniquely shaped for optimal food flow and the titanium coated blade is 6 times harder than steel. An ergonomic rubber grip makes it easy to use. I highly recommend having one of these in your chef's toolkit. Do you have a foodie on your shopping list? Or maybe you'd like some of these items for yourself? *This post has been generously sponsored by Philips. The opinions and language are my own. nice, will check them out. I love the salt and pepper shakers. Too cute! I hear you! Lots of expenses this time of year. Would be nice to give somebody that Philips Airfryer and do a little shopping with the VISA card! Good luck! Love the Don't Poke the Bear cup. And the speccy giraffe made me laugh. Good gift ideas. What a great idea having a Foodie gift guide. Very interesting. How cute are those reindeer salt & pepper shakers! I love the Philips hand blender. I have one and so use it alll the time. GREAT gift that anyone would definately love.. I do think any of the Gifts for The Foodie would be fun to give. I love the mug Don't Poke the Bear and I like the Sea Salt also.